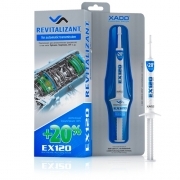 REVITALIZANT® EX120 for diesel engines. 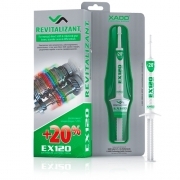 Designed to restore, repair and protect all diesel engines. including high-powered and turbocharged engines, against metallic wear and tear. The gel forms a new cermet coating on friction surfaces (the engine parts grow in volume, restore their original geometry). As a result a renovated unit exceeds the performance level of a new one and will last 2-4 times longer. Processing of the engine with the oil system 3-10 liters. Step 1: Squeeze out the contents of one tube into the oil filer of the engine warmed up to the running temperature. Start the engine and let it idle run for 5-10 minutes. Step 2: Repeat the Step 1 after 62-155 miles. Step 3: Repeat the Step 2 after 62-155 miles. Overhauled engines should be treated in 3 stages according to the normal procedure. During the engine operation cylinder piston group in area of upper “blind” spot, the details of Variable Valve Event and Lift (VVEL), slider bearer of bent and countershaft. Revitalizant contains constructional material which takes up the wear of details. Due to revitalization on the surface of friction pair a new multifunction gradient covering is formed with the number of necessary character rating and strenuous conditions. The details of the engine increase in volume by returning everything that was worn in the process of exploitation. This is an effect of repairmen. Obtained cover has unique properties: more solid, corrosionproof, low gritness. After revitalization details of engine reliably will serve up to 2-4 times longer. This is an effect of protection from wearing-out. 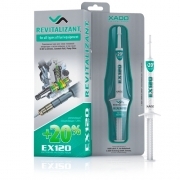 Due to revitalization of an engine significantly increases and aligns compression in cylinder, reduces fuel consumption, increases adhesion and coasting of car, restores of oil pumps, turbo sites, axles and linings, cylinder bearing surfaces, removes ovality. An engine will work quietly and without any vibration. Due to revitalization it can be kept in a perfect condition.